Tsk tsk Mommy…..catch everyone up on my adventures!! Here’s my serious face. My “It’s FREEZING outside” face. Thank goodness for this warm fleece, or I’d be a baby popsicle. 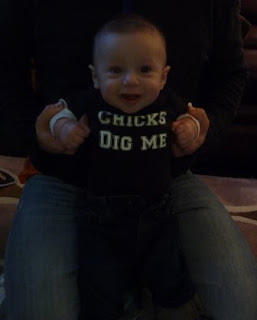 I was asked out on my first date this week, so I thought I’d wear this shirt to let everyone know that I am the MAN. Yep. 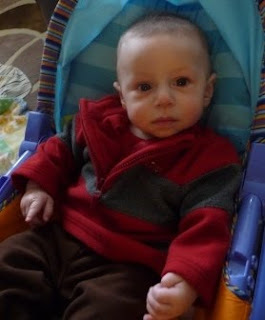 My friend L, from playgroup….you know, the JEWISH one? Well, let’s just say that her Mommy called my Mommy and asked if I was available. Yep. It’s true. Good thing I’m growing big and strong, so that I can drive myself to my own dates soon. 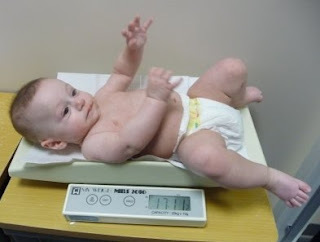 Here I am at my 6 month doctor’s appointment, measuring 27 inches!!!! What??!!! 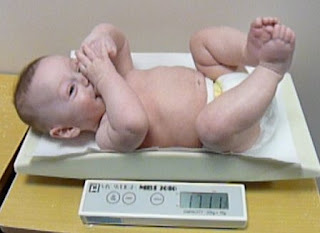 I guess all of that solid food is paying off……nope, you’re not seeing things…..I really am 17 pounds 11 ounces! Well, more like 10 ounces, if you take off this wet diaper! It’s pretty funny that the silly nurse still has me lay up here every time. Ummm, lady? Don’t you think I’m a little BIG for this scale? No wait! There’s more to tell you! Stay tuned, because my Mommy has some GREAT pictures to post this week!